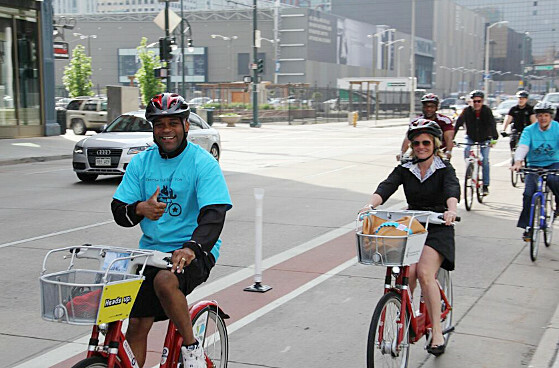 At current funding levels it would take Denver Public Works up to 50 years to build the safe, functional bike network envisioned in Denver Moves, the city’s bicycle plan. That’s why BikeDenver Board President Mark Chapman recently sent a letter [PDF] to City Council President Chris Herndon asking electeds to ensure robust annual funding for bike infrastructure — just like the city does for paving roads — so that it doesn’t take a generation to build a complete network. The letter came as Council deliberated its budget priorities for 2017. After a scathing audit last year revealed the Hancock administration barely devotes any resources to Denver Moves, the mayor and the City Council upped their game, but it was just a one-time allocation of $2.2 million for a plan that costs $119 million to implement. The current funding source for the Department of Public Works is insufficient to meet the goals of Denver Moves Bicycles. In addition, Denver lags far behind comparable cities in their efforts to fund multi-modal solutions. Several cities that Denver considers rivals for the creative class that it so eagerly covets are steadfastly funding their bicycle implementation plans. For instance, Austin, Texas is currently pushing its city council for a $150 million bicycle funding initiative. The City of Seattle, Washington recently adopted a six-year capital improvement program that includes $35.5 million for bicycle implementation. One such innovative funding example is in Philadelphia, where the Mayor is considering taxing soda pop distributors to pay for increased bicycle infrastructure. Without creative solutions like this, the City’s plans to provide a safe network and increase active transportation will inch along year by year, and Denver will fail to meet its goals. The City Council has made “transportation and mobility” one of three top budget priorities for 2017 but has yet to lay out specific dollar figures. Hancock, meanwhile, hasn’t said a thing about how he’ll make good on the city’s commitment to building a real bike network, and he gets the last word on the budget. Stay tuned. Thanks for the mention, David. He hasn’t said a thing about it because he has no intention of ever following through. The local media will be available for the big announcement event, but they don’t care if there is no follow through. Who pays attention – Streetsblog? Buncha agitators is all they are!